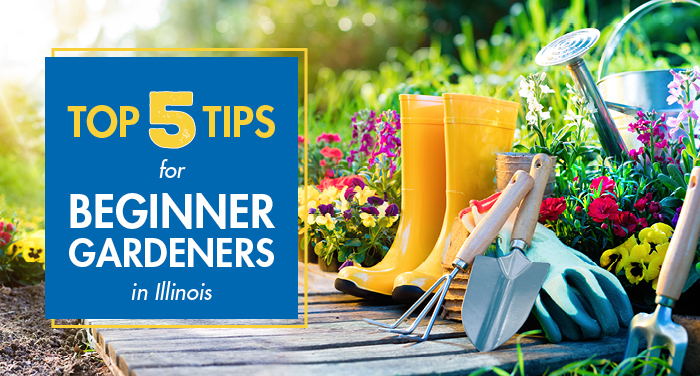 Whether you’re just starting your Illinois garden or you’re wanting to improve your current one, David Sack's list of tips will help your garden get growing. 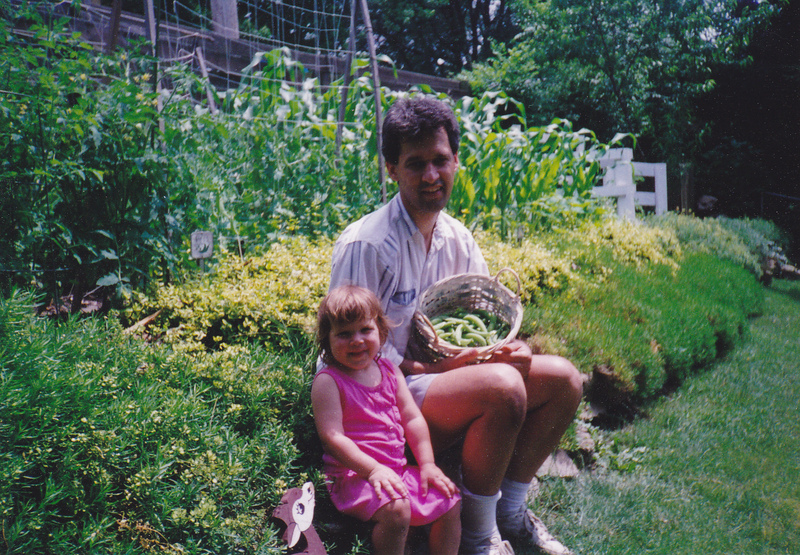 Here are some of the things he's learned over the last few decades from gardening in central Illinois. 1. Choose a site with full sun. Very few vegetables benefit from shade. As long as there is proper watering, the hot summer sun cannot kill a vegetable plant. If the site is completely in the shade, you will get almost no production. Filtered sun (a canopy of trees, for example) is less helpful than a half day in full sun, half day in full shade. But there is no substitute for full sun all day. Photosynthesis cannot occur without sunlight. 2. Pray that when you dig up the dirt for your plot that your soil is loose and crumbly. Ideally, it would be loose, crumbly, and black humus soil. But few people are fortunate enough to have that. If your soil is compacted, you won’t grow anything. Sometimes, people dig too early when the soil is still wet, and even the best soil will clump up and be muddy. You don’t want that. Should you buy black dirt for your garden? Not if you have loose, crumbly soil. Within a year, you can create your own wonderful humus soil (I’ll cover that shortly). On the other hand, if you have clay soil (the worst!) you will have to buy some black dirt to start your garden. Nothing grows in compacted clay soil. More on soil in a little bit. 3. You can grow just about anything you want in central Illinois. I live in central Illinois and have successfully grown onions, potatoes, lettuce, radishes, spinach, peas, rutabaga, carrots, turnips, carrots, corn, tomatoes, bell peppers, hot peppers, summer squash, zucchini, pumpkin, cucumbers, watermelon, cantaloupe, beans, and sweet potatoes. One vegetable that hasn’t worked that well for me is celery. Celery requires a long cool summer, which is rare in Illinois. 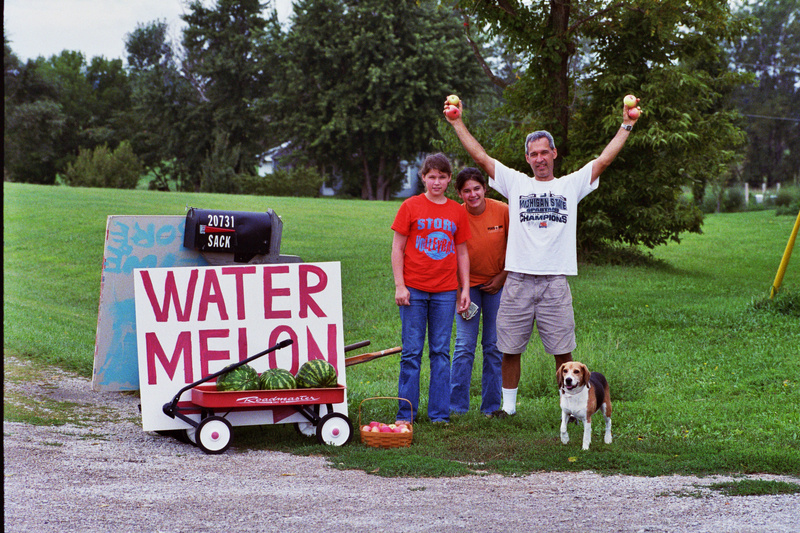 If you live in northern Illinois, you might not be able to grow long summer season vegetables like watermelon or cantaloupe. But a lot depends on how much sun you have and the slope of your land. My garden has full sun and a slight 5 degree tilt to the south, and believe it or not, that creates for more success with plants requiring a long, hot summer season. You can ask my daughters how nice the watermelons have been for us! Many vegetables like radishes, spinach, lettuce, and peas have a short lifespan and can be planted in March and harvested within a month or two. Others like watermelon or sweet potatoes would be planted later – maybe at the start of May – and may take 3 or 4 months to mature. You can buy your seed at a garden store or online. I buy mine from Gurney’s online. 4. Use mulch to combat weeds. Too many weeds? Watering your garden too much? Is your soil getting too compacted? There is one miraculous solution to all of these problems, and it is the most important thing. And please don’t buy wood chip mulch or rock or stones. BAG YOUR GRASS AND PUT IT IN YOUR GARDEN! If you put thick but fluffed grass around your plants, wonderful things happen. You will rarely need to water because the mulch prevents evaporation. It is not unusual for me to go an entire summer without watering. The mulch will knock down most competing weeds. I almost never have to weed. Most importantly, the cut grass (leaves, too, if you have them in the fall) conditions your soil and creates humus. I create mounded rows and plant on the tops of the mounds. My favorite thing in early spring is to move the grass mulch off from the tops of my rows and reach my hand into the soil. Yes! My hand! Not a trowel or shovel. 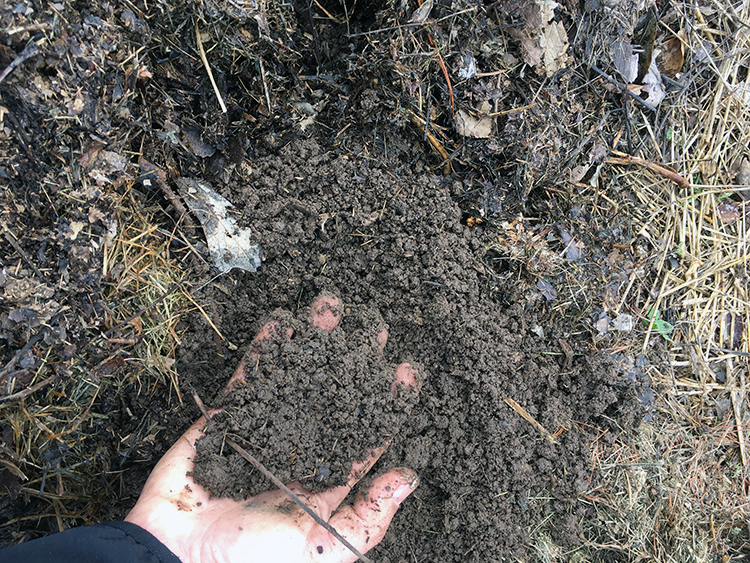 Mulch attracts earthworms and aerates the soil for you, so it just falls apart in your hand. If you have mounded rows, the water will soak deep into the ground, and the top part will be moist but not wet/muddy. Aside from lots of sun, aerated soil is the second most important thing for your garden. By the way, I never fertilize my garden, because the grass clippings (along with wood ash from my fireplace) are my fertilizers. 5. Be vigilant about animals and pests. Do you have animal pests? Rabbits, squirrels, deer, raccoons, skunks? You can try keeping these animals out with limited success using fences, cages, etc. But the easy cure is a dog that stays outside at night. When my beagle was alive (we called him Snoopy), I NEVER had a problem with animal pests. Do you have insect pests? If you have time, the best cure is vigilance. One tomato hornworm can eat a tomato plant in a week. And they are hard to spot. You almost have to run your fingers along each leaf and then when you find them, pick them off and destroy them. 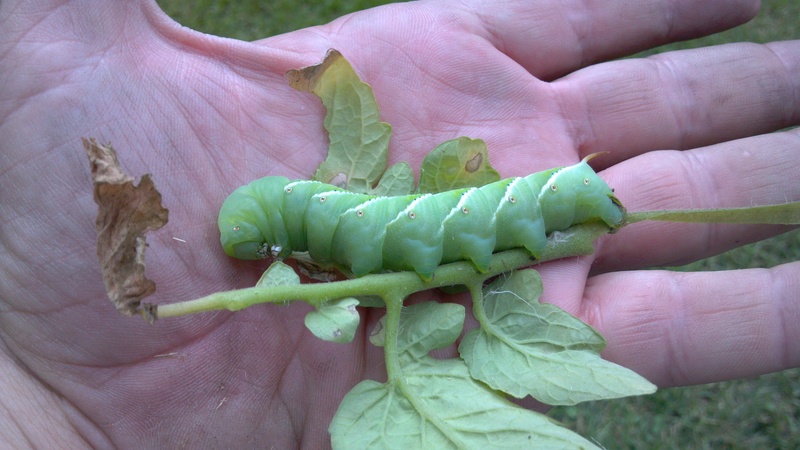 This is a tomato hornworm. They blend in with leaves and feed non-stop, causing your tomato leaves to get spotty and to appear chewed. Look closely at the top of the tomato leaves for dark green droppings – if you see this, there's a good chance there's a hornworm on the underside of the leaf. Each insect has a different way to control it. I almost never spray. You will kill both good and bad insects when you do this. I’m not a tree hugger, but there is an element of harmony in nature. You want to maintain a healthy balance. Sometimes, I just won’t plant a certain vegetable if the insect that loves it has become a nemesis. For example, I have lots of ants in my garden. They actually can be a good thing, because they also till the soil and break down organic matter. However, they always ruin my potatoes, both as they start to grow and after they get going. So no potatoes this year. There is one insect that I have a special hatred for: Japanese beetles. 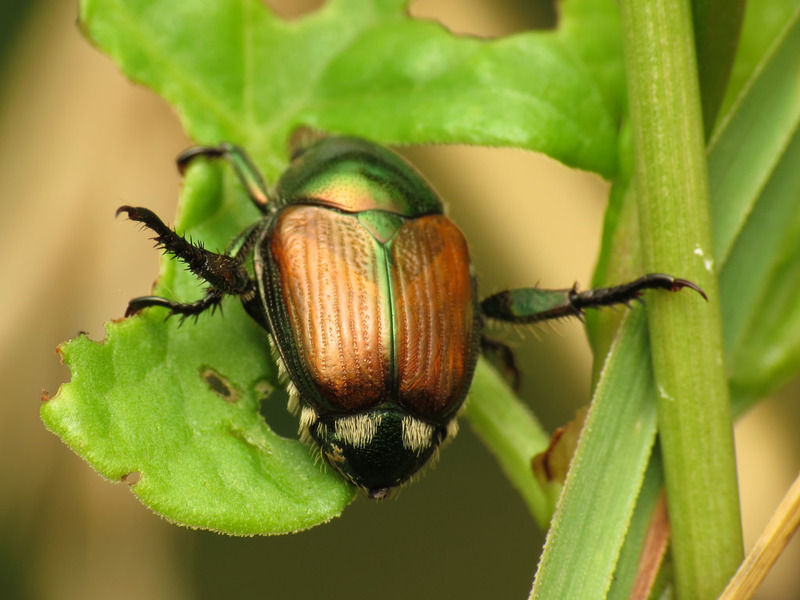 Japanese beetles are classified as a pest to hundreds of different species. You know you have them if the leaves on your plants look like skeletons with only the veins remaining. Almanac says the best way to get rid of them is by picking them off by hand and putting them in a solution of dish soap and water to drown. They go through cycles. When they are rampant, I conduct full-on chemical warfare. In this case, I do spray my fruit trees and my grapevines. Japanese beetles usually don’t hurt the vegetables, though. Squash bugs and stink bugs can hurt cucumbers, squash, and zucchini, and will probably transmit a virus wilt to them. I take it philosophically and get what I can before they die. One year, I had squash coming out my ears and there were no squash bugs. Wouldn’t have minded a couple that year. Hope this helps! Enjoy God’s green earth and all that is in it! David Sack lives in central Illinois and has been gardening for 28 years. 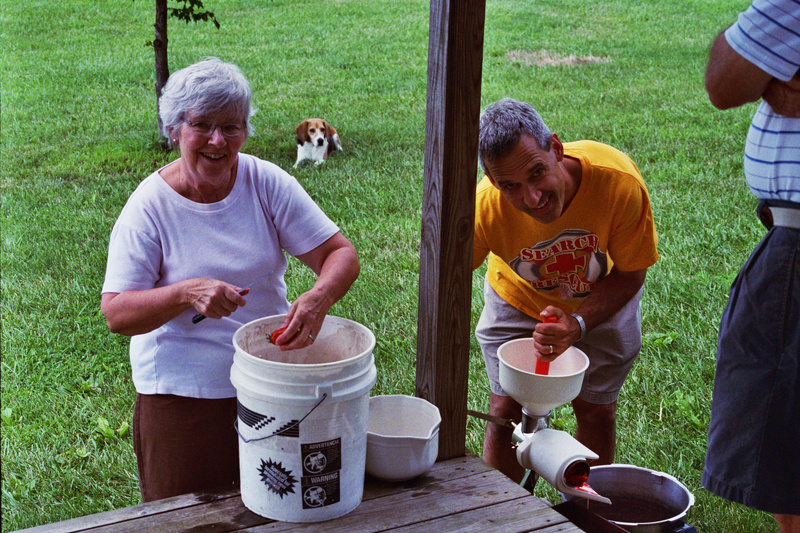 In 1991, he started with some tomatoes, a peach tree, and a homemade compost bin. His gardens produce an annual bounty that fills his basement pantry with canned spaghetti sauce, peaches, pickles of all kinds, salsa, fruit jams and jellies, and more. He calls himself an amateur, but he is truly a master gardener. I felt that you were trying to find the most convenient and economical plans for my situation. It is my feeling that you were always looking out for me, and I trust that you were doing your job to the best of your ability. That is my expectation. If, in the future, anyone should ask my opinion and recommendations, I would gladly share your name/company with them. 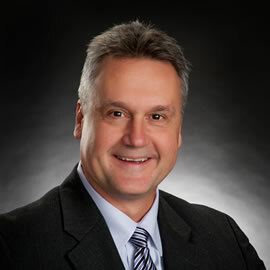 John Hockaday is the Principal of New Horizons Insurance Marketing and the co-Founder of Sams/Hockaday & Associates. John has been business partners with Jeff Sams since 1981.